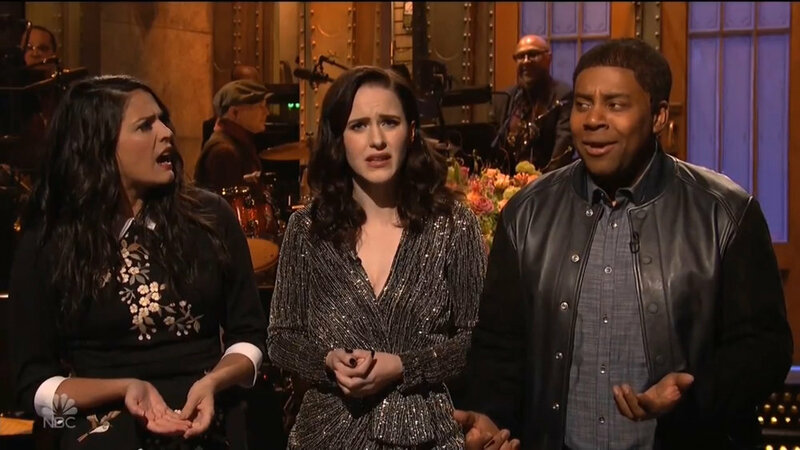 This season of Saturday Night Live can at best be described as unremarkable. While we’re used to perhaps only have one or two sketches hit per episode, this season has seen multi-episode stretches go on before anything memorable is presented. They’ve fumbled the ball when they have strong hosts such as Steve Carell, Matt Damon and Jonah Hill. They couldn’t save first time hosts from flubbing(Halsey, Clair Foy). And if you’ve grown tired of the political takes on the show, this season has put you to sleep. The only two highlights of this season have been the John Mulaney(which is what happens when a former SNL writer is the host) and the fact that the hosting duties have been given to a bunch of people of color(six as of now). But it’s going to take some strong shows to salvage my opinion of this season. Let’s check in to see how the cast is doing. While we still have yet to see a signature character from Bennett, he’s the resident straight man/game show host type that SNL needs. In the canon of Phil Hartman and Bill Hader, Bennett is the go to guy for those types right now. I don’t expect to see Bennett depart anytime soon. Bryant doesn’t seem to be getting as many highlights this year as she has in the past. I still think the “Girlfriends Talk Show” was a hit and why they dumped it is beyond me. Even though it feels she hasn’t done much this season, I don’t see her leaving the show because of it. The same could be said for Mikey Day who was my pick for “Rookie of the Year” a couple of seasons ago. I thought he was a breath of fresh air and on pace to become one of the stars of the show. I haven’t seen as much gold from him as in the past but that probably has more to do with the writing than Day’s talents. Moffat has grown on me. He’s had a strong season and a half and looks like he’s prime to really become a top player on the show. Strong has so much potential to be the star of this show, that it’s frustrating that the writing is holding her back. When she’s let loose on the show, she’s right up there with the greats, but those moments are few and far between these days. Notice a theme here? My affection for Thompson on the show ebbs and flows each season. But for the past couple of seasons, he’s grown on me to the point where I’m fine with him being on the show as long as he wants to be there. With the expected(hopeful) departures of some of the female cast members at the end of this season, Villaseñor has an opportunity to really step forward as a star of the show. The talent’s there, she just needs the aid of strong writing which is absent these days. Someone else who is poised for a run on the show. Redd impresses me every episode he’s featured in. He needs to develop some characters to be a main stay on the show but he’s got potential. Weekend Update is the best its been since Tina Fey and Amy Amy Poehler hosted it. These two can keep this gig for along as they want as far as I’m concerned. I LOVE Kate McKinnon. She’s easily one of the Top 30 cast members they’ve ever had on the show. Every sketch she’s in, I’m focused on her. With that said, she needs to go. Unless she has an iron-clad contract, this season should be her last. Her “break out” window is starting to close with the film duds she’s been in(The Spy Who Dumped Me, Rough Night) and she with the increased demand for content on Netflix, Hulu and Amazon, she would be perfect to star in a series. I would be shocked and a bit annoyed if she came back next year. I’m just going to enjoy the McKinnon SNL train as long as I can. I want to hang out with Leslie Jones. I want to share a meal with Leslie Jones. I want to go watch a scary movie with Leslie Jones. But I don’t think I want to see Leslie Jones on SNL. This woman as so much creative fire that I don’t think SNL knows how to handle it. It’s rare to say that SNL is stifling someone but that’s the case with Jones. This season should be her last so she can go become the best female stand up in the world. If I had the chance to talk to Mooney I would simply ask him, “Do you want to do this anymore?” His off-beat humor rarely hits and he doesn’t stand out very much in the sketches he’s featured in. He’s another one that I feel would thrive if they had their own series on Amazon. Time to move to greener pastures dude. Gardner’s trying, she really is. But something isn’t clicking because she’s rarely featured and when she is, she’s playing the same two to three characters. I’m sure she’s ten times more talented that what she’s being given on the show but unless she’s a lightning rod in the writing room, this season should be her last. Given how little we’ve seen her and how she’s usually cast as the straight person in most sketches, those aren’t typically good signs that your run on the show is going to be long. We’ve seen plenty of one-and-done cast members in the past and I think Nwodim’s name will be added to that wall. Here’s the honest truth: Davidson needs to go. When he’s not a tabloid distraction, he’s weak in sketches and his only semi-interesting moments are when he addresses said tabloid distractions on Weekend Update. If Davidson’s TMZ life was enough of a rating’s draw, I’d understand why he’s on the show. But it’s not. I know he’s had some personal struggles and I wish him only the best. But this should be it for him on the show. I think he’d be better suited for stand up where he can let loose.